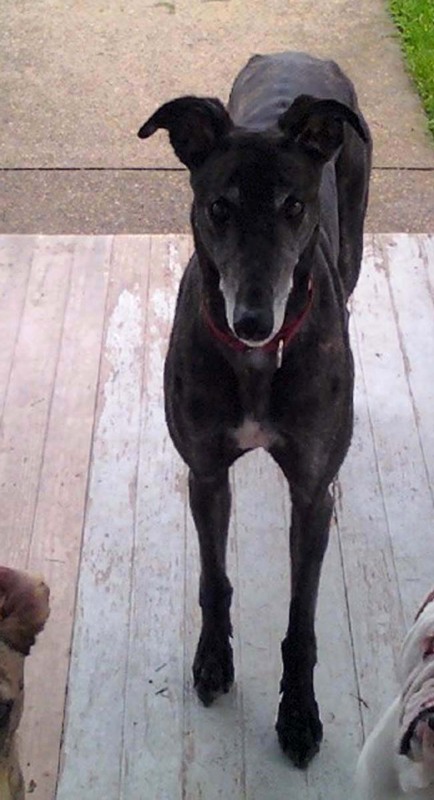 We are sad to report that another wonderful greyhound has crossed the Rainbow Bridge. We got notice from Jason Grove that he lost his best friend after a short illness. Jason adopted Trouble from our group in January 2006; he and Trouble became frequent visitors to our meet and greet events. Everyone loved seeing Trouble because he was truly an exceptional greyhound. He was loving and sweet and was one of the most gentle natured greyhounds we’ve ever met. He was also strikingly handsome with a shiny dark brindle coat and eyes that danced. He was a scene stealer! We know that Jason is devastated over the loss of Trouble. We will all miss this sweet boy so much! We know that Trouble is flying with angel wings at the bridge!